The plot is the usual opera seria one, set in Egypt with long lost brothers, people in disguise and frustrated lovers. All the arias on the disc are for the two leading roles, Rosinda and Emireno, who were both originally played by female sopranos. 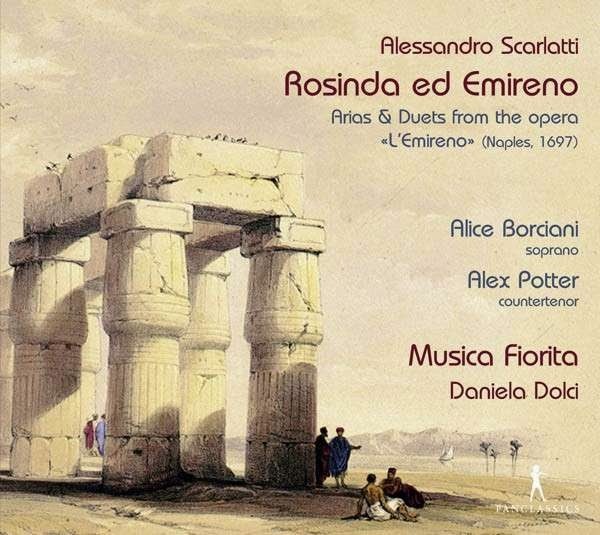 Italian opera seria was often gender-blind; on this disc, a female soprano plays the male role of Emireno, whilst a counter-tenor plays the female role of Rosinda. Scarlatti's arias are generally short and frequently seem to have a dance rhythm underlying them. Whatever the emotions of the characters, Scarlatti's response is personable and highly appealing. There is a simplicity and melodiousness to his writing which makes for very attractive listening. The involvement of the cornett brings an interesting, rather gravely melancholy feel to the sound world. Much of the writing for cornett seems high, and it participates on a number of arias. Not only the graver numbers such as Non pianger solo dolce usignuolo, but in the livelier ones such ias Va scherzando in which the voice effectively has a duet with the cornett with each vying with the other. Alice Borciani has a slim, bright lyric voice with a technique which copes admirably with the complexities of the vocal lines. Similarly Alex Potter impresses with his sweet, soft grained counter-tenor. We get to hear them together in two duets as well as their solo numbers. The first a perky number with a dancing violin obliggato, the second a more melancholy one where each has a solo moment before concluding the duet in dialogue. The sonatas by Legrenzi (published in Venice in 1633) are attractively performed and break up the texture of the CD in just the right way. The Swiss group Musica Fiorita was founded 20 years ago by Daniela Dolci. On this disc Dolci directs from the harpsichord with Bork-Fithjof Smith (cornett), Katharina Heutjer and Miki Takahashi (violin) Jonathan Pesek (cello), Brigitte Gasser (viola da gamba and lirone), Juan Sebastian Lima (theorbo). For those interested in exploring further, counter tenor Alex Potter is also the soloist on the recent EUBO Handel disc (see my review). And I reviewed Fabio Biondi and Stavanger Symphony Orchestra's complete recording of Scarlatti's opera Carlo, Re d'Alemagna earlier this year. Scarlatti's opera has a slightly curious history. It was long attributed to Giacomo Perti, but when Musica Fiorita performed on of the arias from the opera a Perti scholar realised that the opera was in fact by Scarlatti. It would be interesting to hear the whole opera, there are comic elements involved too. But this disc gives us a fine window onto Scarlatti's Rosinda ed Emireno in attractive performances.